I just finished my 25 day paleo challenge yesterday, so today was the first day that I could cheat. My plan was to keep up paleo for one more day before going and eating some sushi but I ended up cheating today. What happened? I was cooking my dinner and while I preheated the oven a cooking sheet with little bits of cookie was left in the oven. This filled the whole kitchen with the smell of cookies. Avoiding cheating became impossible and I ate some chocolate and cookies. I bought junk food instead of real food, feel free to judge me. After the first cheat I decided to go out and eat everything I have been craving for the past 25 days, mainly some Halloween themed cupcakes. 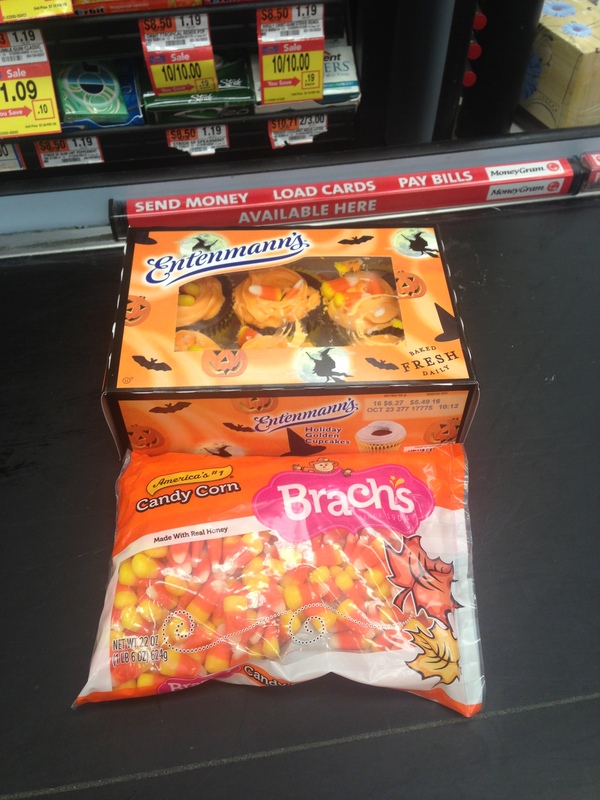 I also bought some candy corn, which has always been one of my favorite candies. 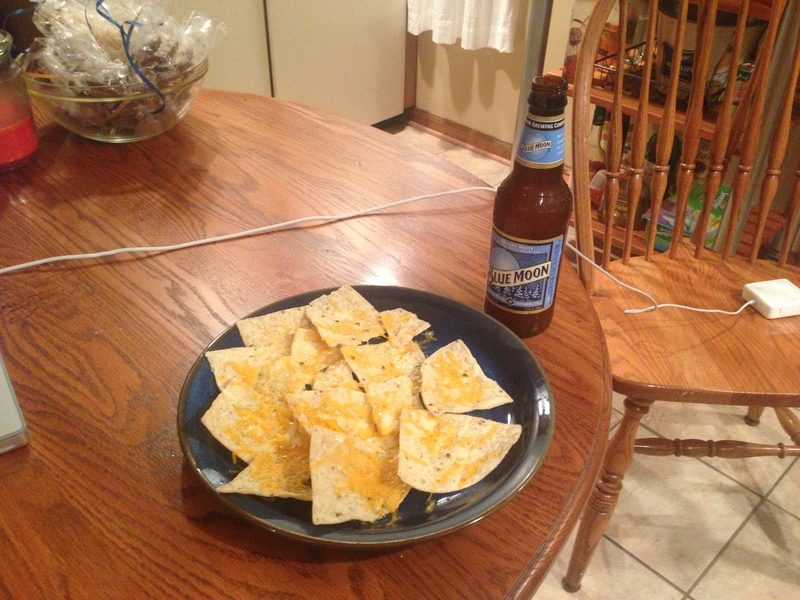 Then I went and bought some Blue Moon and Pumpkin beer and the ingredients for nachos. So how was the cheating after so much healthy eating? Not that great, in fact totally not worth it. From now on when I want to cheat I need to come back and read this post. The candy corn tasted syrupy and too sweet. I didn’t really even enjoy it but forced my self to eat it anyway. What is wrong with me? The Halloween cupcakes looked so good but it turned out that they weren’t chocolate cake but vanilla cake. I am not a big fan of vanilla cake. So neither were worth it. I only ended up eating half the cupcake before throwing the rest away. I’ll bring in the rest of the cupcakes to work on Monday and let my coworkers absorb the calories I don’t need, ha ha. Some nachos and beer, NOT WORTH IT! I also had beer and nachos. I’ll admit the Blue Moon was really good, that was the one part that was worth cheating. The pumpkin beer was ok but kind of had an overwhelming taste to it. The corn chips without the cheese tasted like cardboard and with the cheese was only a little better. I think 25 days of healthy eating really changes your pallet. I still need to go to the food and wine festival this weekend and I need to eat some mexican, ice cream and dunkin donuts before my cheating end. However I am totally ready to go back to 100% paleo. This is the first time that I haven’t welcomed cheating and enjoyed every second of it. I guess I am making progress with adapting to paleo. I need to do more of these paleo challenges. You had me at “totally not worth it”. On these kind of nights I wish I had a time machine and could tell myself that! I think you had to experience it to know. Otherwise, you find yourself thinking either “I wish I had” or “maybe it wouldn’t have been so bad”. It’s all your choice, and that’s the coolest part of it. You are right. This is not the first time I cheated and it won’t be the last but now I feel like I don’t want to cheat as much as I used to. My taste pallet is changing so junk food doesn’t taste as good. In the future I know that I don’t love candy corn anymore. I hope you learned your lesson! I have been there Fitness Wayne, and I do not cheat as much anymore, cause I know how I will feel if I do. Love your site! Thanks for sharing! Thanks for stopping by. After this past round of cheating I do not plan to do much cheating in the future. I have realized that my tastes have changed and the unhealthy foods don’t appeal to me as much anymore. Certain things like GOOD beer are worth “cheating” for and get a higher priority on my list of things I will cheat for everyone ONCE in a while. Another good example is sushi and lest we forget, some good cookies. On the other hand, things like corn chips? Flavorless and totally pointless unless dumped in sauce and then, I start to think, I’m eating it for the sauce and not the chips, so… Why? I could just make the sauce and toss it on my omelet, my meat, or my veggies. Certain things are comforts to “cheat” with every once in a while, so don’t judge me! Some other things, I will never eat again since going primal. And I think you know EXACTLY what I mean. I agree with you. If I am drinking beer it is not going to be Coors or Bud. Sushi isn’t that bad of a cheat because it doesn’t have gluten. I have also had the weird puffy eye or face, or joint pain or some other odd reaction after giving in to some dumb impulse and eating some non-food (as you say, totally not worth it). Plus indigestion or burping. I find a nice long IF is really the best way for me to clean out the reaction and get back on track! Right now is the first time that I haven’t been really looking forward to the next time I get to cheat. It helps that I am constantly finding new paleo foods I love. My newest food is dark chocolate. I am excited to eat fruit again after my ketosis experiment ends.